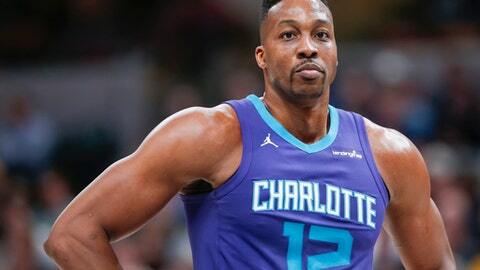 CHARLOTTE, N.C. (AP) — The Charlotte Hornets have agreed to trade eight-time All-Star center Dwight Howard to the Brooklyn Nets for center Timofey Mozgov and two second-round draft picks, a person familiar with the situation told The Associated Press on Wednesday. The 32-year-old Howard played only one season for Charlotte, averaging 16.6 points and 12.5 rebounds per game. He is due to make $23.8 million this season, the final year of his contract. After spending three seasons with the Houston Rockets, Howard was acquired by his hometown Atlanta Hawks in 2016 as a free agent and signed a three-year contract. But he wore out his welcome after one season and was dealt to Charlotte. The Hornets, who are in the midst of a major organizational shake-up, having already replaced their general manager and coach, could be on the verge of shaking up their roster, too. Howard struggled to mesh with guard Nicolas Batum, and the Hornets failed to make the playoffs despite what former coach Steve Clifford considered the team’s most talented roster in half a decade. This is a reunion of sorts for Mozgov. Recently hired Hornets general manager Mitch Kupchak signed Mozgov to a four-year, $64 million deal in 2016 when both were with the Los Angeles Lakers. While the move allows the Hornets to unload Howard’s contract and save about $7 million under this year’s salary cap, it is a bit of a gamble because Mozgov has two years remaining on his current contract at $16 million per year. Mozgov’s numbers pale in comparison to Howard’s. He played in only 31 games last season for the Nets, averaging 4.2 points and 3.2 rebounds. The 7-foot-1 Mozgov has not played a full 82-game season since 2013 and has averaged in double figures only once during his eight-year NBA career. By contrast, Howard has averaged 17.4 points, 12.7 rebound and two blocks per game since joining the league in 2004.